Stella and I are designers for Red Pulse, a collection of beautiful poems. This collection is the culmination of our collective efforts in the ULT2298E: Chapbooks and Digital Poetry: Poetics Mash-Up class. As designers, we exercised our prerogative and wrote a humorous editors' introduction. Quite a number of our classmates, including our lecturer Prof Shirley Lim, got an early Christmas surprise. It has been a life-changing experience and we were shaped into sculptures symbolizing universal equality and brotherhood of Mankind. As Universal Scholarly People, we were – and still are – appreciated like the sculptures of elegance and beauty that we have been chiseled into. In our sacrificial service as Editors, we have grown green and strong under the brilliant sunlight of the Shirley, just as the grass in Town green has so thrived on the soils of Knowledge. 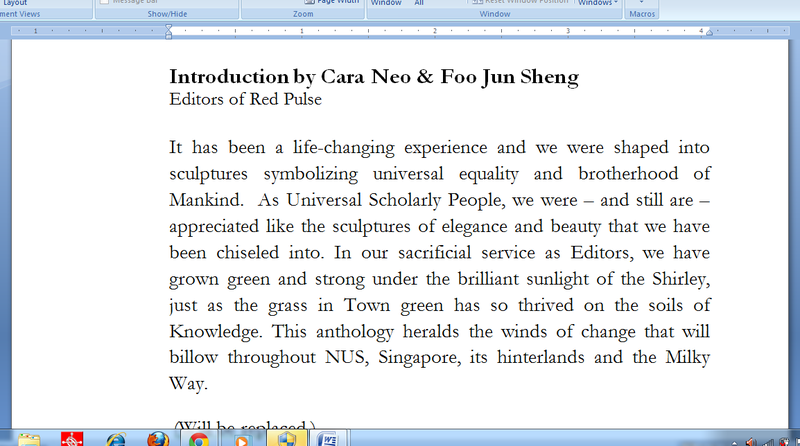 This anthology heralds the winds of change that will billow throughout NUS, Singapore, its hinterlands and the Milky Way. For some reason, no one wanted the above introduction to be used. Come on, we thought that it was a fascinating piece, one bound to raise many eyebrows. At any rate, Cara - she's one of the real editors - felt an impetus to write a proper introduction during class time after reading what was written. With a class introduction like that, we knew this semester was going to be pretty special. For four hours each week, we had the opportunity to come into a common space, “leave our guns at the door”, and be honest—with ourselves, with each other, and in our art. Shirley’s (or Prof Lim, to some) guidance and poetic philosophy have been invaluable in fostering a spirit of camaraderie among us writers. We came to realize the importance of a writing community as a safe sharing space in which we could completely and comfortably immerse ourselves in the stories that we would go on to tell through our craft as poets. Red Pulse is an extension of that. Its creation has been an amazing journey, and a testament to how great things can begin in small ways. As editors helming the production of Red Pulse, we never thought putting together an anthology would be so difficult, but it was. We did, however, think it would be worthwhile—and it has been, thrice over. The call for submissions garnered a fantastic response, and we received numerous poems that we were eager to showcase in the anthology. After making our selection, we spent one night moving poems around until we came up with our five chapters and their titles. By then, people were already stepping forward to offer their skills and services—whether as copy editors, illustrators, designers, or production managers. 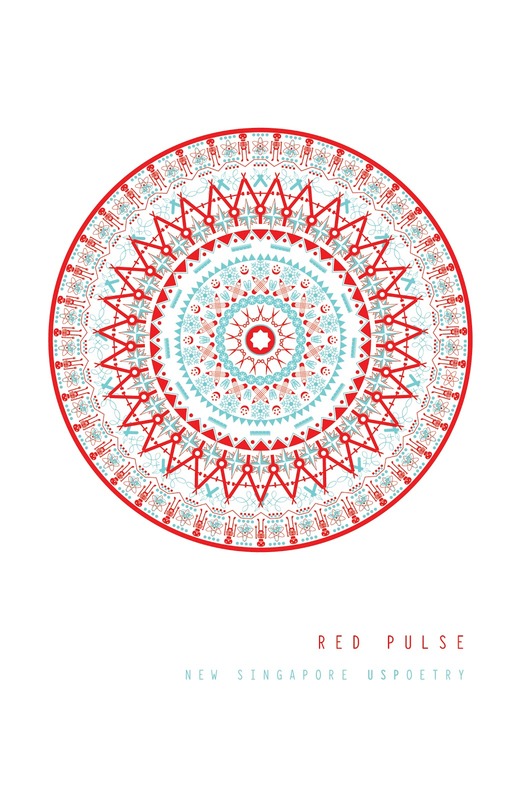 It was heartwarming to see the whole class claim their share in the weaving together of Red Pulse. The poems that you will read in this anthology are diverse. Some of them are indubitably Singapore poems, commentaries on the city state that we call home. Some of them are about family, love, friendship. Some of them are poems that exalt the abstract; some are derived from the minutiae of the everyday, which one might overlook. What underscores all of these various voices, however, is a whole lot of heart. This is a collection of honest poetry that seeks to sustain and to revitalize the proverbial Red Pulse, the creative impulses that have animated our lives in this little red dot. We hope you will enjoy this collection. 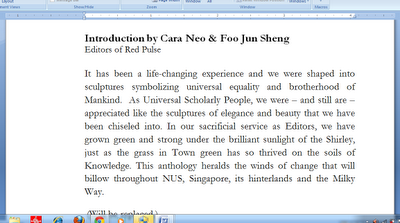 The above editors' note by Cara and Jun Sheng resonated. This module on crafting poetry has been an eye-opener. We've learned the value and power of a single word. We've formed a community where we could allow ourselves to be vulnerable, a community where we could examine our experiences without fear or judgement. We spoke about the past that have brought us love, gave us joy and scarred us. We talked about our hopes and dreams. I'm grateful for the opportunity to take this module under Prof Lim and with my new-found friends.